It's Back to School time again. The air is cooler. The grass and leaves and evenings are turning gold. Parents are complaining about the expense of books and uniforms and worrying about how their little ones will settle into the new school year. I've decided to give my daughters another year at Naíonra (Irish language preschool) and put off the inevitable until they are 5. 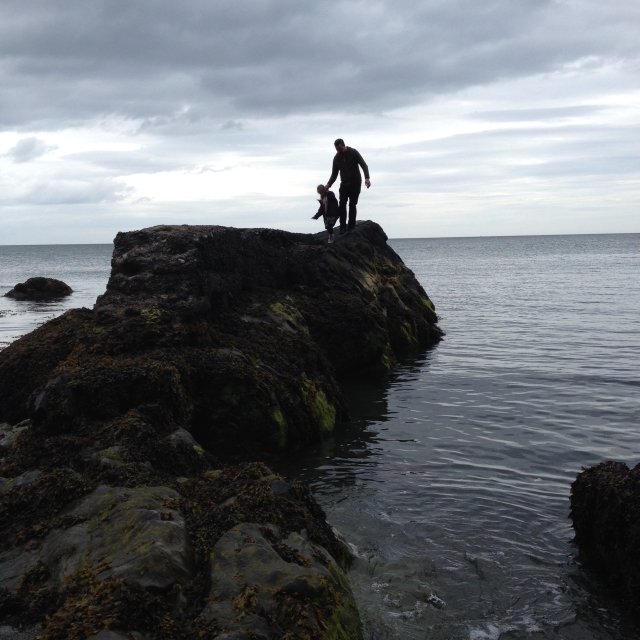 They LOVE their Naíonra and so do I, so I'm in no hurry to pack them off to big-school just yet.... BUT this is the year we have all of the stress of trying to get a place in the 'right' school and a good portion of time will be spent filling out forms and keeping an eye on registration dates and crossing our fingers, hoping we get two places in our preferred school. 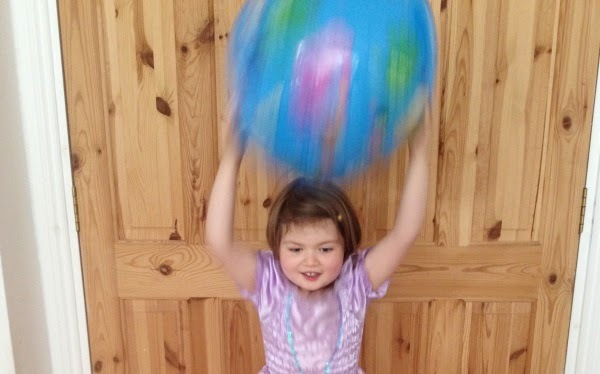 I want our girls to attend a Gaelscoil (Irish language immersion school) and I hope that by sending them to a Naíonra and speaking as much Irish as possible at home they will be well prepared for next years leap to Primary School. Some Gaelscoileanna have an interview process for families wishing to attend the school, so I want them to be ready for that too. I'm a fluent Irish speaker (my parents sent me to a Gaelscoil too!) and I've worked in the area of Irish language revival for many years - helping families who want to use more Irish at home make language plans and advising them on resources to help them along the way. 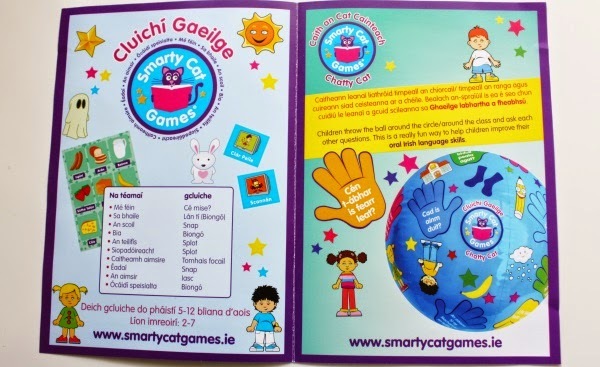 I always get excited when I see new Irish language resources come onto the market - especially ones that encourage spoken language - so I was thrilled when I was contacted by Smarty Cat Games and asked if I wanted to review a couple of their products. I was given two games Caith an Cat Cainteach (The Chatty Cat Ball) and a Snap game with the theme 'Éadaí' (clothes) to try out with Lile and Sábha. Over the years, I have come to recognise that one of the most daunting things about learning a new language is actually hearing yourself speaking it. I don't remember learning Irish because I acquired it in early childhood but I DO remember learning French and German in my teenage years and cringing at the sound of myself pronouncing new words in accents that sounded completely unnatural to my own ears. That's why I really like the idea of the Chatty Cat Ball especially. 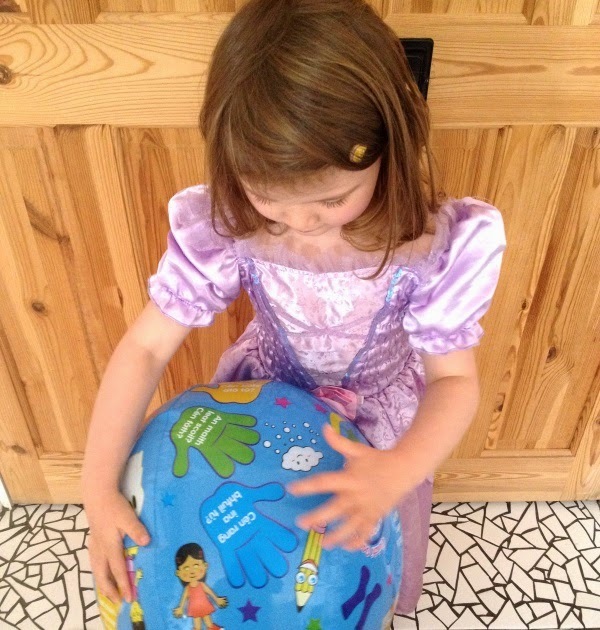 It encourages children to ask questions and give answers in a really fun, informal way. There are prompts and 21 questions/actions printed on the ball, so there is plenty of scope for 'chat'. The earlier children get used to hearing themselves speaking Irish, the more natural it will become for them so fun and informal is the way to go! My girls really enjoyed this game and even enjoyed naming the colours and pictures on the ball itself. Already 'knowing' things is a good way to build confidence in language skills too. The Snap game is one part of a set of 10 games which are perfect for a classroom setting. I have already used this game with the girls as flashcards, as a traditional snap game and as a memory game. My sister, (who is a primary school teacher in a Gaelscoil) suggested putting paperclips on the cards and using the magnetic 'fishing rods' we have from another game to add another element to it - so really there is a LOT of potential for fun with this simple game! If you are keen to help your child with Irish, these games are a fantastic way for the whole family to learn/practice together. Don't forget to check out their other products HERE. You might also like to mention Smarty Cat Games to your child's teacher too, these games would be a wonderful investment for any school. 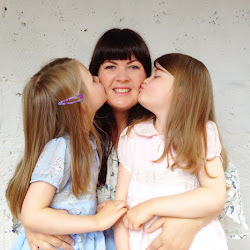 For more ideas to help you start using more Irish at home visit Wholesome.ie to see the guest post I wrote earlier this year: 5 Easy Ways To Use Irish With Your Children. Disclosure: I was given the Chatty Cat Ball and the Snap game free of charge for the purposes of review. All opinions are my own and I was not paid to give them.